It sounds like science fiction, but the technology has already been developed in a public-private partnership between the National Renewable Energy Laboratory and New Energy Technologies, Inc. Tina Casey of Clean Technica gives us all the details in her guest post below. I think she would agree – this is an exciting time to be a tree-hugger. If researchers could develop a low cost, invisible solar cell to sub in for ordinary window glass, the result would be a sustainability twofer of epic proportions. Windows are notorious as a weak spot for energy efficiency, even in newer buildings. That goes double for millions of older buildings in the U.S. Upgrade to new see-through solar cell windows and you get to cut down on energy loss, keep all the energy savings from using natural daylight whenever possible, and generate renewable energy, too. 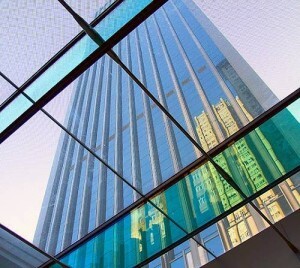 In terms of President Obama’s national energy policy, see-through glass solar cells provide another pathway for transforming the nation’s stock of older, inefficient buildings from an energy-sucking liability into a major source of clean, renewable energy. With that in mind, let’s take a look at the invisible solar modules being developed in a public-private partnership between the National Renewable Energy Laboratory and a company called New Energy Technologies, Inc.
Miami Urban Green | Solar panels as inexpensive and as easily applied as paint?